All litter and gut to be taken home. Close all gates and stay off crops. Fences should not be damaged and stiles must be used. No parking on property without permission. Show courtesy to others at pools. No bait digging or fires at or near the river bank. Bag limit of 5 trout per day. No fishing from a boat. 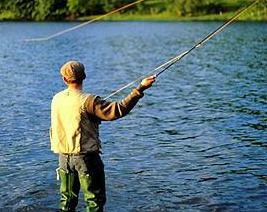 Membership entitles anglers to fish only one rod at any given time. Prohibited area from the pailings at the golf coarse through Lady Moyola's estate. ALL SALMON TO BE RETURNED UNHARMED AS QUICKLY AS POSSIBLE TO THE RIVER. ALL DOLLAGHAN OVER 3LB MUST BE RETURNED UNHARMED IN THE MONTH OF OCTOBER. Any person found breaking any of the above rules may have his/her permit withdrawn.